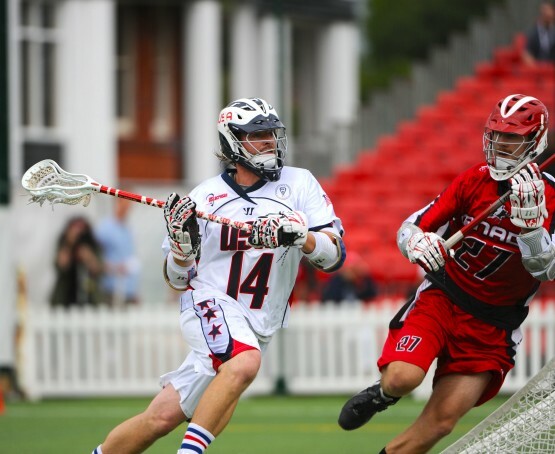 In order to preview this weekend’s Duel in Denver field lacrosse game, featuring Team USA vs. Canada, LAS will be there as part of the Grow The Game Tour, and we got the chance to check in with some of the biggest stars and leaders from Team USA. First we spoke with Jesse Schwartzman, then we got caught up with Matt Danowski and now we kick back with the elder statesman, Ryan Boyle! You’ve been on your fair share of US Teams, and while each one is different, how does this version of the team stack up? Ryan Boyle: It’s hard to say. This squad is still in infancy, and nothing is finalized for 2014. While there is some continuity, it is also a chance for newer guys to prove themselves. Some were still too young or didn’t try out in 2010. There is a certain level of pressure at this level, so it gives the coaches an opportunity to look at new guys and see how they fit in. Photo Credit: John Strohsacker / LaxPhotos.com courtesy of USLacrosse. So what kind of role will the Duel in Denver play in the development of the 2014 Men’s Team, or could we see a very different team in two years? Ryan Boyle: This team definitely has a bearing on the 2014 squad. Performance, leadership, and the ability to produce when needed will all be on display in this game. Building relationships, how players mesh together; all of that is important. This game should not be overhyped as a preview of the 2014 team, but it should not be downplayed either. You won’t MAKE the team or NOT make the team in Denver, but I would think that one’s performance overall can definitely help or hurt. Now that the Canadian roster has been released, how do you feel the two teams stack up? Ryan Boyle: There is talent all over, so it should be a good game. The thing to remember is that Canada is our main competitor at the Worlds, so if a guy can play well against that brand of lacrosse, it will help for 2014, and I think this goes both ways, and for both teams. Chris Schiller is a great past example of a US player that really knew the opposition; he knew their skills, tendencies, personnel, etc. The Duel in Denver is an opportunity for new (and old) guys on both teams to prove the same thing. There are more USA guys filling the “Chris Schiller” role in the NLL, so we could potentially see more Schiller-esque US players in the future. We’ll also see better poles coming out of Canada, as more of their guys play field lacrosse collegiately. Who is the one player you are most excited to play with OR against, in the Duel in Denver, and why? Ryan Boyle: I’m definitely most excited to play with Matt Striebel. It’s been a while since we last played together, and he is my best friend. We got one year together at Princeton, then played on the Barrage for a couple years, and Team USA in 2010. I’m also looking forward to playing with younger, better-looking guys, like Steele Stanwick, who I have watched and admired from afar. What is the single best, and worst, thing about International Lacrosse? Ryan Boyle: The best thing has to be the camaraderie and patriotism. It’s all about pride and honor, and representing your country. It’s an opportunity that I will always cherish. Of course there can be a downside too. The worst thing in my opinion is that International Lacrosse is a slightly antiquated brand of lacrosse, at least when compared to the MLL. It can be really hard to adjust to the change in rules, and the different style of refereeing. The latter is totally different, especially on things like slashes. So should we combine the rules into one updated format? Should other versions of the game see the two-pointer come into use more heavily? Ryan Boyle: The two-pointer would be great. Ultimately, it’s sort of like we’re still playing basketball without the 3 point line. It’s the best comparison to lacrosse and without the 2, we are holding on to traditions that are possibly outdated. The two pointer rewards players for their ability to shoot the ball and it sets good parameters for spreading the defense, without outlawing things like the zone defense. When it comes to one code of rules for all levels of the game, I wouldn’t go that far… but there should be a strong resemblance throughout. Basketball from college to pro to International is all pretty similar… and I think that is a good model to follow. What area of the US most impressed you with its recent growth? What area of rest of the the world impresses you the most? Ryan Boyle: A lot of areas really impress me and its great to see it growing firsthand. CA, TX, FLA… Japan. It all amazes me and is great to see, as I come from a more established lacrosse area. What does Lacrosse need to get to the “next level” in the general sporting consciousness? 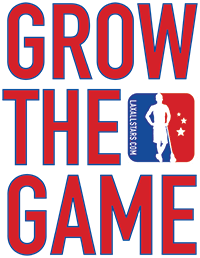 What are you doing to Grow The Game? Ryan Boyle: For me, this is pretty simple. The sport needs to decide what it wants to be: do we want to be the next major American sport or do we want to continue on as a niche sport? If we want to go major it’s easy. Make the game more accessible and easier to understand by removing things like the stalling rule, which all hangs on a ref’s interpretation. Stuff like that is confusing for new fans, but a long-term part of the game historically. If we want to go mainstream, it can not be difficult for a casual fan. If we want to stay niche? Well then we can do whatever we want. Polo, rugby, etc. – all are a bit confusing, with nuanced and weird rules, and they have had a hard time crossing over to the main sporting population. If lacrosse stays as is, it could be hard to shake that stigma. The community needs to decide what we want to do, THEN go for that goal. I know this is easier said than done. Any predictions for the Duel in Denver, either personal or team? Ryan Boyle: The only guarantee I can make is that I’ll be watching Peyton Manning’s comeback on Sunday night! 2012 Mann Cup Preview - Canadian Summer Box Lacrosse Finals!